Over the years tends to become flat, limp & lacks volume. 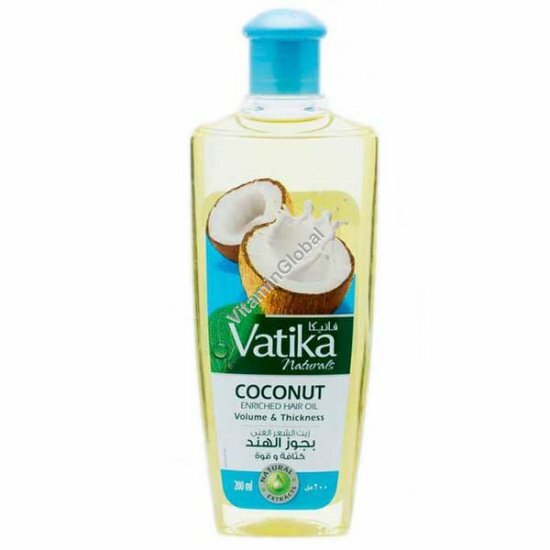 New Vatika coconut Enriched hair oil contains coconut oil and the nourishing extracts of Castor & Henna. Its unique formulation strengthens hair strand from root to tip, giving your hair volume & thickness your always desired. Coconut: Penetrates hair shaft to strengthen & is known to make it thick. Castor: Helps to prevent hair fall. Henna: Along with other ingredients coats & conditions the hair shaft. Directions for Use: Use your fingertips to gently massage the Vatika Coconut Enriched Hair Oil into the scalp and the hair. Allow the oil to penetrate through your scalp by leaving it for an hour. Rinse your hair thoroughly.